One of the amazing things about living in a subtropical rainforest in Australia is the wildlife. Australia has a very large lizard called the Goanna. For those in America, I guess it’s got similarities to the iguana, but actually more closely related to the Komodo Dragon. Goannas are a type of monitor lizard and can grow in size over 2.5m (8.2ft). The one I photographed here in my backyard is about 1.8m long. He hissed a warning at me several times. Goanna are hunting carnivores known to eat venomous snakes, amongst other things, including sheep, as many farmers have complained over the years. 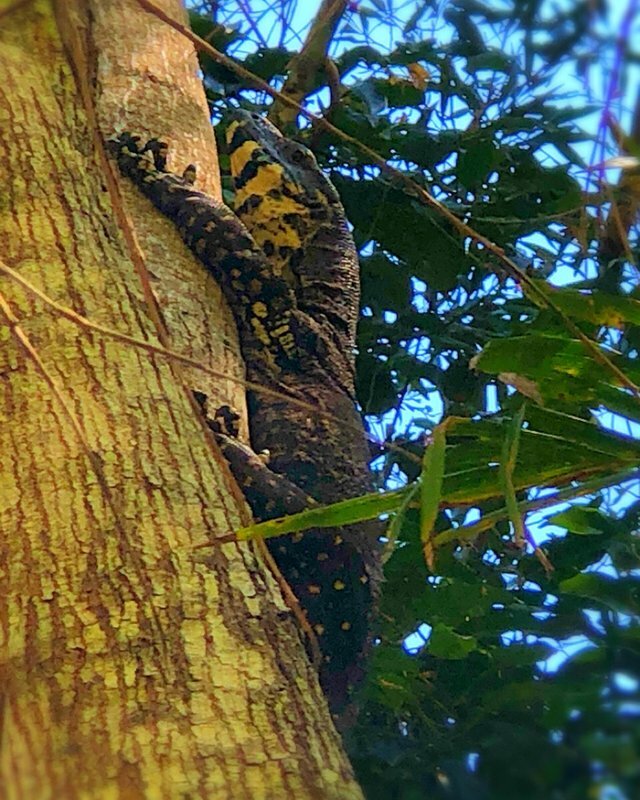 There’s a debate going on now about whether goannas, like some of their monitor lizard cousins, like the Komodo dragon, have venom sacks in their mouths because of the incessant bleeding caused by their bite. Anyway, I like having this big fella nearby. She’ll/He’ll keep the deadly snake population down, which will keep my house safe. Therefore, this lizard is like a guard dog against venomous snakes.